It requires additional licenses for the Basic Package, the Mixture Predict Add-On as well as the data banks DDB-ACT and DDB-AZD for optimum performance. A first step in Process Synthesis for separation processes usually is the identification of azeotropic points in the multi-component mixture. The software is able to find homogeneous azeotropes in five component mixtures and heterogeneous azeotropes of up to three components. It utilizes the Wilson, NRTL and UNIQUAC model plus different group contribution methods like UNIFAC and mod. UNIFAC. In process simulation, it is of great importance to verify, that the thermodynamic model and parameters correctly describe this hehavior! Residual curves describe the course of a batch distillation. In case of a continuous rectification (no side streams, total reflux, ...) top and bottom product compositions are both situated on one residual curve. The feed composition can be found on the straight line connecting top and bottom product composition and can be calculated from the relative amounts of the products via mass balance. Certain points in the ternary diagram, the pure components and azeotropic points, are of special importance. These points may be connected by boundary curves, which cannot easily be crossed by normal distillation, thus separating individual distillation fields. 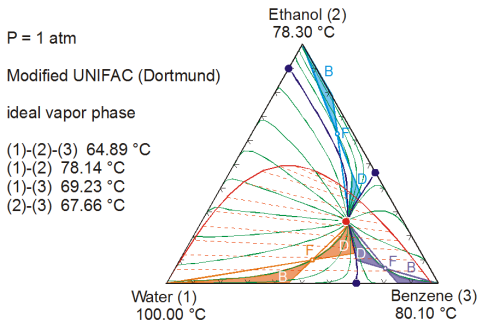 For homogeneous systems, feed and product compositions are situated in one distillation field. In case of heterogeneous systems, the liquid on a tray or in the condenser or reboiler may split into two phases. One of these phases or both may be situated in a different distillation field. This allows to cross distillation boundary lines by separating the two phases with the help of a decanter. A ternary system without any azeotropic points does not contain any boundary lines and the residual curves connect the highest boiling component with the lowest boiling component. No residual curve originates or terminates in the medium boiling component. The pure medium boiling component represents a saddle point with respect to temperature or pressure. If any azeotropic points are present in the mixture, boundary lines can be found interconnecting the azeotropic and pure component points or additional azeotropic points. The areas inside the distillation region never show any maxima, minima or saddle points with respect to temperature or pressure. These extreme values or saddle points are always at the special points (pure components or azeotropic points). The following plot shows the residual curve map for a complex ternary mixture with immiscible region calculated by the software. Three different feed concentrations and the resp. possible bottom (B) and distillate (D) concentrations have been added. It is obvious that without the knowledge of this behavior, the design of a distillation column for this system is extremely difficult. In process simulation, it is of great importance to verify, that the thermodynamic model and parameters correctly describe this hehavior! Another possibility to show the behavior of ternary systems in a 2-dimensional form is with the help of the so-called contour or iso-lines. These curves represent all compositions in the ternary diagram, which show the same value for a selected property (e.g. boiling temperature or pressure, separation factor between two components, ...). Usually contour lines for different equally distanced values are included in one diagram. The mod. UNIFAC model predicts the behavior very close to the experimental finding with a monotonous decrease in separation factor to values below 0.4 with increasing entrainer concentration. Using UNIQUAC with parameters supplied by a major process simulation software leads to the unrealistic opposite effect at higher NMP concentrations. This again stresses the great importance to verify the calculation results of the simulation thermodynamics! 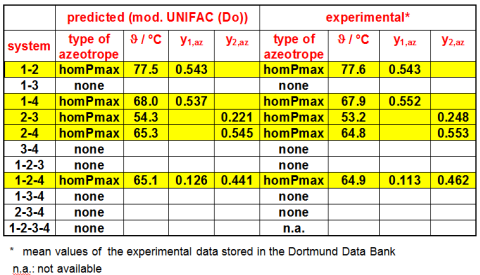 In some cases the azeotropic behavior disappears at lower or higher temperature (pressure) and ordinary distillation is possible at these different conditions. 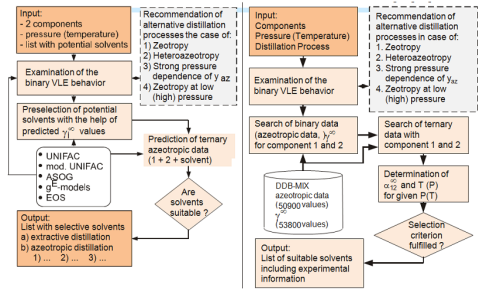 In case the azeotropic composition varies strongly with temperature (pressure), pressure swing distillation is often used. This situation arises mostly if the enthalpy of vaporization and consequently the slope of the vapor pressure curve of the two components to be separated differ significantly as for water plus organic components. In case the mixture forms a light boiling heterogeneous azeotrope, the distillate streams of two columns are condensed and the liquid phases are separated in a decanter and recycled to the columns. The pure compounds are obtained as the bottom products of the columns. In extractive distillation, a high boiling solvent is added slightly below the top of the column. Its task is to alter the ratio of the activity coefficients of the two components to be separated. In case of the aliphatic-aromatic separation, the interaction between e.g. NMP and the aromatic electrons of benzene lowers the volatility of benzene. At sufficiently high NMP concentrations this results in a separation factor of less than 0.4 between benzene and cyclohexane. In a second column the selective solvent is recovered and recycled to the extractor column. In case of azeotropic distillation, a suitable solvent is added which forms the lowest boiling azeotrope with one or both of the components to be separated. This light boiling azeotrope is obtained as the top product. In case of an hetero-azeotrope, separation of entrainer and product is usually simple. In other cases a similarly simple separation of this mixture has to be found.